Scooby-Doo, the crazy cartoon Great Dane, got his start back in 1969 on the Scooby-Doo, Where Are You! series. The show ran for just two seasons and 25 episodes but Scooby, Shaggy, Fred, Velma and Daphne proved so popular that they’ve since starred in numerous other series, live-action movies, animated movies, comics, and much more. You can purchase DVD or you can also try to win a copy here. To enter, you need to merely post a comment below.You can enter once per day. UPDATE: Congratulations to Matt Coleman who won this DVD set in our contest. Thanks to everyone who played and we’ve got more contests coming! More about: Scooby-Doo Where Are You!, Shaggy & Scooby-Doo Get a Clue! My daughter loves Scooby & the gang, and the original episodes are far superior to today’s! 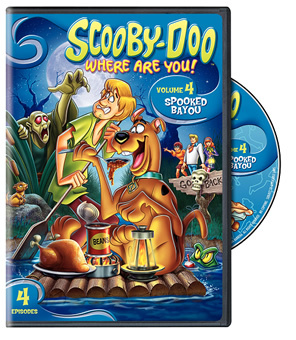 Scooby is amazing and this DVD looks awesome. Definitely enter me. Another show I loved as a kid, who didn’t really? Scooby is still good after all these years. Entering again because Scooby-Doo is awesome! My whole family loves Scooby-Doo! We have watched just about every series they ever made. Even the two movies and the two Cartoon Network movies were fun to watch. Would love to have this to carry on the Scoobarific tradition with my little one. : ) Please enter me. The Scooby Doo gags still are first rate after all those years! LOVE THE SHOW! HAVE EVERYTHING SCOOBY DOO THIS WOULD BE A GREAT ADDITION!